Micro Fun With BBC TV’s Doctor Who! It’s perhaps surprising that it took so long for Doctor Who to crash-land on the home computer for the first time. The software industry was developing rapidly throughout the early 1980’s, but whilst we were all busy entertaining ourselves with bouncing hedgehogs, dodgy wizards, and suicidal frogs, it seemed peculiar that nobody was tapping into such an obvious and potentially lucrative market as Doctor Who. Things finally got moving in the right direction when the March 1983 edition of Computer & Video Games magazine hit the shelves. Being the proud owner of a 16k Sinclair ZX Spectrum at the time, I hadn’t previously paid that much attention to this publication, preferring to spend my hard-earned paper round money on a magazine that was devoted to my own computer, instead of wading through pages and pages of deeply irrelevant stuff about the Oric, the Dragon, the Texas, and the Tandy Supersaver Special. But that afternoon in WH Smith, my usual copy of Sinclair User stayed on the shelf, as Tom Baker peered out moodily from the cover of Computer & Video Games, promising a genuine first - a Doctor Who program was inside the pages, waiting to be typed in and played with frenzied excitement on your home computer. It didn’t matter that Tom Baker had already left the show a couple of years earlier, and that it should really have been Peter Davison being threatened by an Egyptian Mummy on the front cover. It didn’t matter that the program listing inside the magazine was not, as I had hoped, for my beloved Sinclair Spectrum, but was instead for the Atari 400/800 machines. Well, actually, that’s not quite true, that did matter quite a bit and sort of cocked up the whole experience, although it served as a valuable lesson to me to check the actual contents of what I’m supposed to be buying rather than just going on a Tom Baker cover. And so, for several weeks, I could only look longingly at the three pages of program code for Doctor Who Adventure, and imagine just how thrilling this unique adventure on the Pyramid planet of Strardos IV was going to be. I even briefly considered getting an Atari 800 just to find out. Eventually, I finally managed to find a friend who actually owned one of these machines, and convinced him that we should spend a glorious Sunday afternoon at his house typing in these three pages of tiny printed code. He would rather have gone out on a bike ride, but I’d promised him this was going to be infinitely more special, and he wouldn’t regret it. 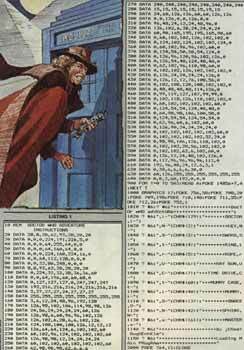 For those of you who can remember these golden days of typing in program listings from magazines, I’m sure you will fondly recall the endless hours of fun you could have by carefully typing in the whole program, only to find that the game didn’t work because you’d mistyped a single digit somewhere along the way, resulting in having to go back and check every one of the three squillion lines of code to try and find the rogue digit. It was getting towards dusk when the program was finally complete and working, and we couldn’t wait to see the results of our hard work. 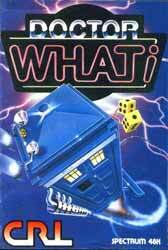 After all this time, we were going to play a Doctor Who video game. It was absolute pants. It was a ridiculously simple and basic maze game, it bore very little resemblance to anything even vaguely connected with Doctor Who, and it seemed to crash whenever you were doing quite well. 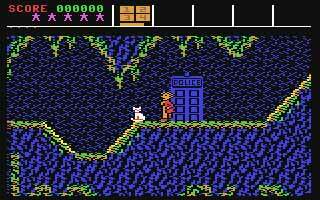 The first commercially released game would come a little while later in the autumn of 1983, when the promisingly titled Doctor Who - The First Adventure hit the shelves for the BBC Micro. 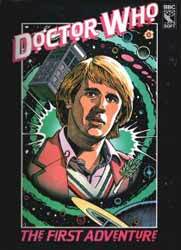 This arrived in psychedelic packaging depicting an unusually pink Peter Davison, and came with an extensive and wordy manual describing the imminent showdown between the Doctor and the Black Guardian, which perhaps promised just a teensy bit more than the game would ultimately deliver. Again, I would have been struggling to get this to work on my Sinclair Spectrum (and was now beginning to get a bit miffed about the lack of Timelord activity on my machine) but it didn’t take too long before I could check out the game on a mate’s rubbish BBC computer. It was actually a combination of four separate arcade games, each one lovingly ripped off from such well-known favourites as Frogger, Pacman and Space Invaders. The graphics were nothing short of appalling, and unless you were holding the lavish packaging in your hand, you would have had difficulty in even knowing you were playing a game that was supposedly based on Britain’s best loved science fiction series. Having said that, they were at least fairly playable in their own right (for the time) and at least progress was finally being made in actually getting Doctor Who titles on the game shelves. 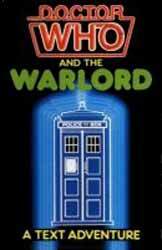 A second official title was released for the BBC Micro in 1985, Doctor Who and The Warlord. This was a pretty dull and lifeless text adventure which came in two completely disjointed parts (you had to complete the first futuristic part to get a code to enable you to play the second historical part), neither of which were much cop. I used to write more interesting text adventures than this myself when I was about 11 years old. Despite being advertised on television, the game went largely ignored by the gaming public and quickly sunk into oblivion (probably not helped by the fact that the release coincided with the show’s 18-month hiatus) and it’s now pretty difficult to track down an original copy. A version for the Sinclair Spectrum was planned, but this never saw the light of day. During all this time though, unlicensed product had been quietly sneaking into the homes of Sinclair Spectrum users, proving that my choice of machine had not been a total waste of my time. 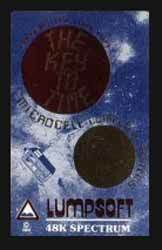 1984 had seen the release of The Key To Time from Lumpsoft, a simple but fairly absorbing text adventure written exclusively for the Spectrum, in which you must guide your unofficial Doctor through an epic unofficial adventure using a completely unofficial TARDIS. To be honest, it’s quite staggering that the BBC lawyers didn’t swoop down on this one. It happily incorporates several of the show’s trademarks (the Doctor, the TARDIS, the Daleks, Skaro, Gallifrey, even the 1960’s Sensorites show up to prove that this was definitely written by a fan!) but this light-hearted and fun adventure somehow managed to get away with it completely. I can only assume that the low-key nature of the release meant that it got missed by the mighty BBC radar, although I can certainly remember advertisements and reviews in the computer press. The chances of now tracking down an original copy are close to nil, but the game is well worth discovering for free using a ZX Spectrum emulator on your PC. Even cheekier than this was the release of Doctor What! for the Spectrum by CRL in 1986. This was an arcade adventure in which you could separately take control of four severely hung over Doctors (What, Where, Why and When... no, there’s no Who!) who are trying to make their way home from a party, each one of them having their trusty time-travelling vehicle the TRYDIS (yes, it’s getting a bit lame now, isn’t it?) to guide them on their ultimate quest of locating the Jelly Baby of Infinite Wisdom. Having been lured in by the bold packaging quite blatantly featuring a proper TARDIS on the front cover (I think the BBC lawyers may have been napping again), I did initially feel a bit conned by this release, especially considering the pretty hefty price tag. 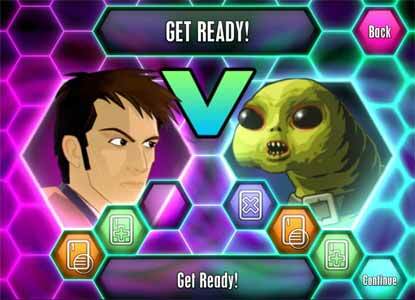 As well as ripping off Doctor Who, the format of the game stole heavily from the classic Wally Week games of the time, although it wasn’t anywhere near as good and already felt a couple of years out of date. Having said that, I did eventually get a bit of enjoyable game play out of it as I guided each Doctor through a series of well thought-out puzzles and traps, and it would have been a fairly good buy at a much lower price. It was certainly the closest yet that a Spectrum user could get to playing a Doctor Who game on his cheap rubber keyboard. Whilst the Spectrum still waited for a proper official title, other popular formats were about to get the biggest official release yet. Looking back, I can remember that this game was very difficult to track down in the shops on any format, leading me to guess that there may have been distribution problems somewhere along the line. I eventually had to settle for the expensive disk version, as I was convinced at the time that the tape version didn’t even exist. 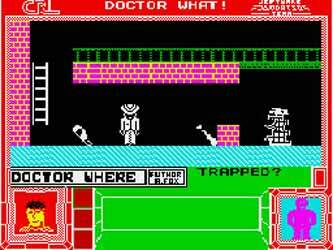 The game itself features Colin Baker’s Doctor in what at first appears to be a relatively straightforward platform game, but soon opens up into quite a complex affair which took a fair bit of concentration to get to grips with. Keeping faithful to the spirit of the series, the Doctor doesn’t possess any weapons but instead has a robotic cat called the Splinx, which the player can program to carry out simple commands and instructions, whenever the Doctor himself gets a bit stuck. (I imagine that this was originally intended to be K9, but the guys at Micro Power ran into licensing problems). It was all pretty sophisticated stuff for the time and, despite the slightly grotty graphics and the appalling in-game tune, it provided me with many hours of head scratching and rewarding gameplay. Sadly, it didn’t do nearly as well as it should have done, and Micro Power sank without trace very shortly afterwards. 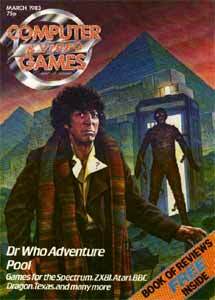 After this, things went very quiet on the Doctor Who games front for several years. The series itself had gone through a huge dip in popularity, threatened cancellation, falling ratings, threatened cancellation, and finally, er, cancellation. You can hardly blame the major software houses for looking elsewhere for licensing rights that would entice the computer kids. But then, quite by surprise, Alternative Software announced a major new Doctor Who title in 1992, not bad considering that the show had been dead for three whole years. 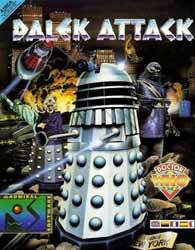 Dalek Attack was to be released across a wide range of formats including the Commodore 64, Amiga, Atari ST, PC, and, yes, even the old Sinclair Spectrum! Fortunately, it was saved at the last minute, thanks in part to a campaign run by Your Sinclair magazine, and actually ended up being the last ever licensed game of any kind for the ZX Spectrum. The game itself was very similar on all the formats. You controlled Sylvester McCoy’s Doctor (and a second player could control his companion Ace) in a fairly straightforward platform shooter, as you travelled through major world cities in an attempt to foil a Dalek invasion of Earth. Nothing groundbreaking and it hardly set the gaming world alight, but it was simplistic fun for a while. 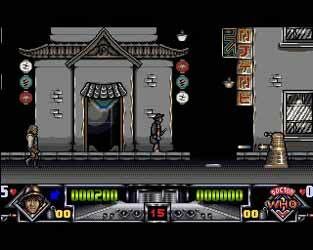 It was particularly pleasing to see the Doctor make his debut on the 16-bit machines, and the Amiga game was the superior version by far. Here, you even had a choice of Doctors and Companions to play, and it was quite thrilling to battle the nicely rendered Daleks, Robomen and Ogrons, as you headed for the final showdown with Davros. 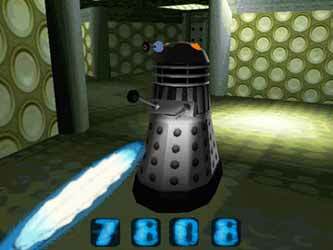 There were hushed rumours of a sequel to be called Cybermen Attack, but this never came to fruition, and Dalek Attack was to be the last of the old-school home computer games for Doctor Who. 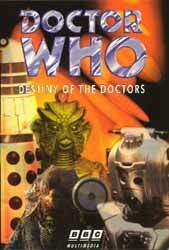 The TARDIS would lie dormant until 1997, when BBC Multimedia ushered in the next level of Doctor Who gaming with the release of Destiny of the Doctors for the PC. Great things were expected from this, Doctor’s Who’s first tentative step into the modern gaming era. 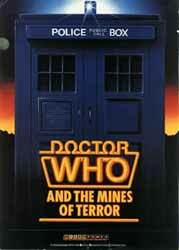 The game was set in a huge 3-D environment, in which the player could take a leisurely stroll around the vast corridors of the TARDIS, solve riddles with the help of newly recorded audio material from all surviving Doctors, and engage in battle with Daleks, Cybermen, Autons, Zygons and a whole menagerie of other foes from the show’s history, as you face an ultimate battle with The Master, as portrayed in brand new video footage starring Anthony Ainley. Wow. That all sounds like quite something, doesn’t it? And for about the first ten minutes, it’s definite jaw-dropping stuff. It’s a pretty thrilling experience to navigate your way around a 3-D TARDIS for the first time, and come face to face with an Ice Warrior whilst Tom Baker’s voice offers you helpful advice in the background. Sadly however, the game plays like an absolute pig. You don’t actually play the Doctor himself, you play a ridiculously vague jellyfish-like creature called the Graak, who seems very unresponsive to the most basic of controls, and has great difficulty in manoeuvring past the simplest of obstacles, which is very unfortunate when you’ve got an army of Cybermen behind you. The ‘puzzles’ that you have to solve are so obscure that it borders on sheer lunacy. At one point, I had the complete solution in front of me, and I was still struggling to make sense of what it was that I was supposed to be doing! It’s not entirely without merit. It’s great to see Anthony Ainley ham it up as The Master one last time before his death, and some of the sub-games can be quite fun (including a London Underground train race featuring the Yeti, and an enchanting trip through the Celestial Toymaker’s toybox!) but ultimately, it’s a huge disappointment. It’s clear that a lot of time and care was taken on the product, but not nearly enough attention was given to the game play, resulting in a missed opportunity for something truly special. 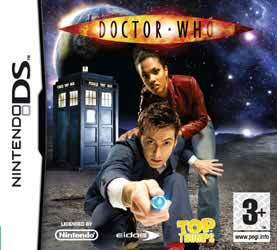 It was to be the last official Doctor Who game for over ten years. 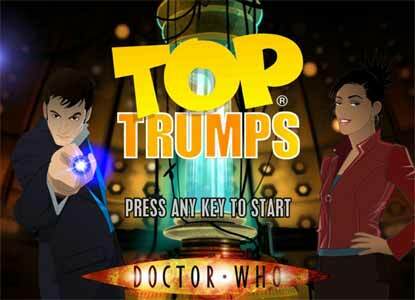 This brings us bang up to date in 2008 with the brand new release of Top Trumps: Doctor Who - The Infinite Quest for the PC, Playstation 2 and Nintendo DS. It seems that 25 years on from that original listing in Computer & Video Games, we’re still waiting for a definitive Doctor Who computer game that fully embraces the huge advantages of such a unique brand.